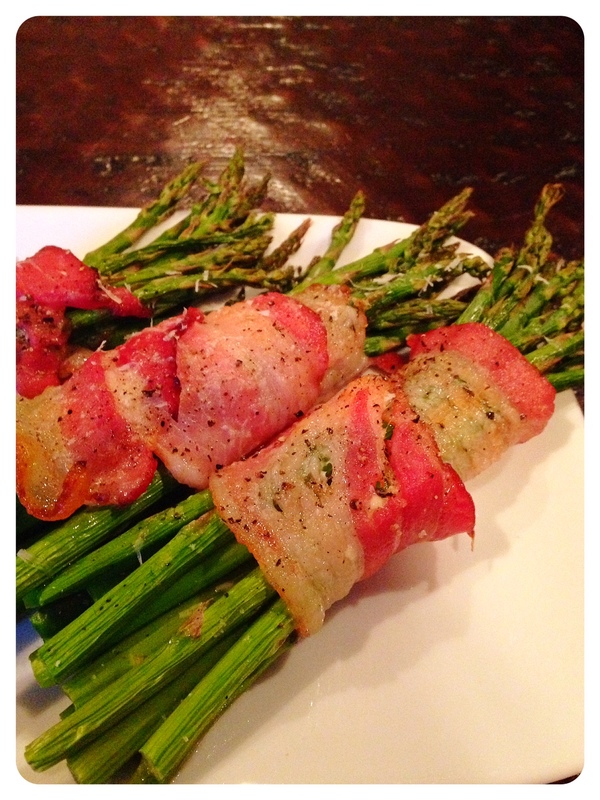 Pecorino Romano and Bacon Wrapped Asparagus | Kitchenpants! I don’t know about you, but when I was a kid, I couldn’t wait to be an adult. All of my pretend games centered around adult activities. There was “Alison’s Store” which consisted of hawking items from the confines of my closet. Also high on the list was “Work”, a game in which I would pack my mom’s ledger paper and a calculator into a briefcase and crunch numbers under the stairs in the basement. And, of course, “Prom” in which Libby Kurtz and I would dress up and dance with our pretend prom dates to the music of Michael Jackson (The Girl is Mine was the song of choice…yeah, I don’t know, but I can tell you that my pretend prom date looked like Jon Baker from CHiPs and my real one looked pretty darned similar. Look at me making my fantasies a reality. Dream big, kids!). Of course, I always envisioned the adult version of myself to be very sophisticated with long feathered hair, red lips, and just the right pantsuit for the occasion (because it was the 80s and Blair Warner was my idol) and speak in sentences that began and ended with “Darling” as in “Dahhhhhhrling…be a dear and fetch my purse for me?” Slightly British with a twist of the southern drawl – that’s how Grown-Up Alison would converse with the world. So very, very disappointed…In addition to sounding like the weak version of Vanilla Ice, Grown-Up Alison doesn’t even wear lipstick AND she likes asparagus. But really, there’s nothing not to like in this recipe. Bacon-wrapped asparagus isn’t groundbreaking, of course, but the Pecorino Romano in this recipe adds the right amount of salt and depth of flavor. Raw Asparagus – How much depends on how many bundles you need to make. Each bundle holds 8-10 skinny stalks. Pecorino Romano Cheese – Get a block. You need larger slices. Thick-Cut Bacon – Uncooked* – One slice per bundle. Trim the asparagus by taking the end of the stalk between your thumb and forefinger and bending until it snaps. If you are doing a high volume of bundles and don’t want to trim each piece individually, then trim a few by hand and use them as a guide to trim the rest by knife. Slice the Romano into slices no more than 1/8 inches thick and less that 2 inches wide. You will need 3-4 slices per bundle. 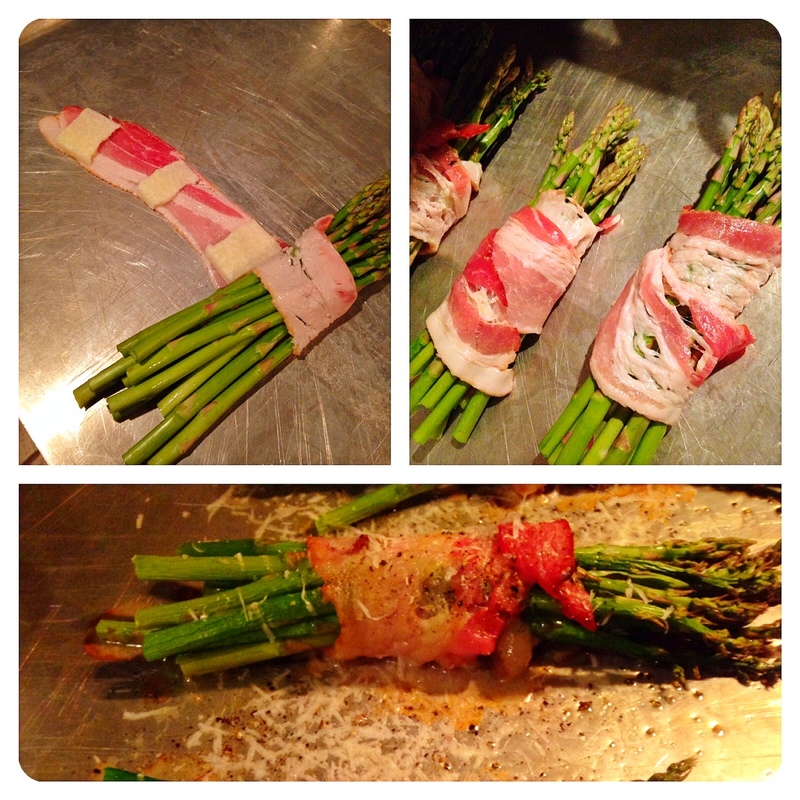 Make the bundles by grabbing 8-10 stalks of asparagus and laying them on the end of a strip of uncooked bacon. Place the cheese along the length of the bacon and wrap the bacon around the asparagus so that it is in a single layer most of the way around the bundle (some bacon edges may overlap). 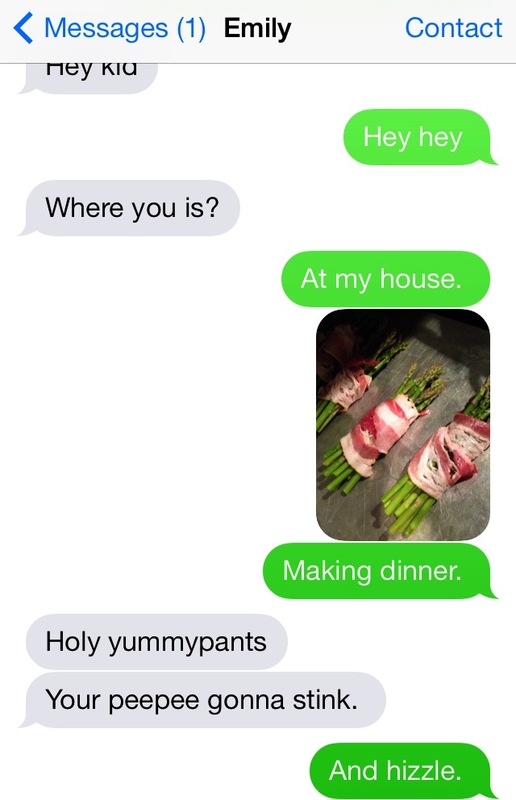 You want the bacon to cover as much asparagus as possible. Coat your baking sheet in a thin (thin!) layer of olive oil by drizzling the oil on and spreading it over the sheet. Lay the bundles on the sheet and sprinkle with salt and pepper. Bake for 18-20 minutes or until the asparagus is just about roasted nicely. Keep an eye on the pan. When the asparagus is almost done, turn on the broiler and let the bacon crisp up for just a few minutes. Remove from the oven. You may elect to grate a little more cheese over the bundles. You may serve these warm or at room temperature. Enjoy! *Full Disclosure: (Eyemuffs, Mom.) I didn’t use uncured bacon for this. It’s a long story of the recent snowstorm (one inch of snow in Texas) requiring me to shop at a store that doesn’t carry uncured bacon. I used Hormel Black Label Thick Cut…and when I make this again, I might just do the same!